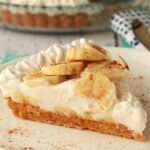 Vegan Pumpkin Cheesecake – Easy and No-Bake! 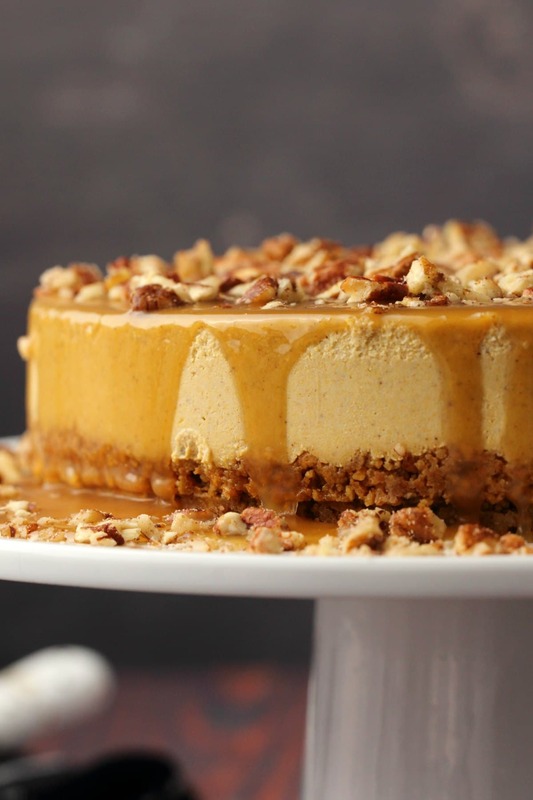 Vegan pumpkin cheesecake you guys! 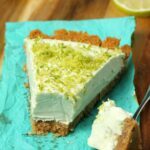 I am officially crazy about this cheesecake! Last time we made a cheesecake we got some feedback on facebook that, even though it was decadent as heck, folks could do with a vegan cheesecake that was less on the healthy side. They were wanting to see some vegan cookies and vegan butter for the crust, none of this nuts and dates stuff! Well, we are so happy to oblige! I like a good cookies and vegan butter crust just as much as the next person! 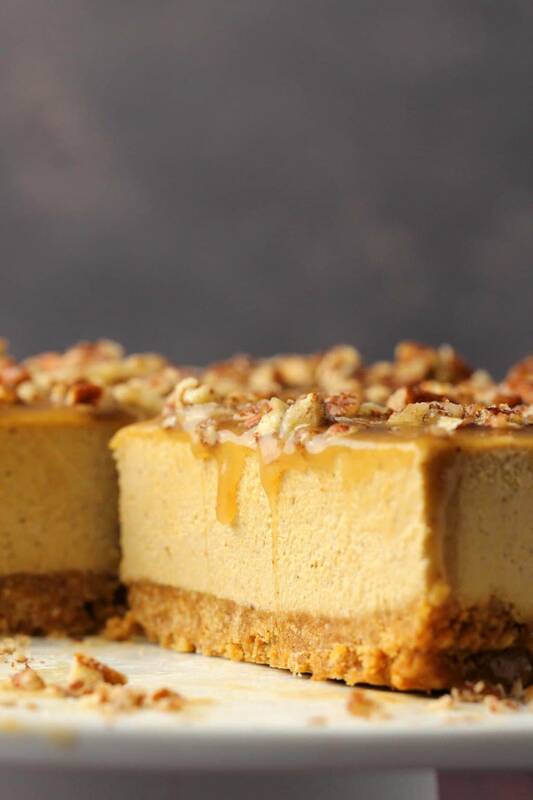 So this vegan pumpkin cheesecake has a ginger cookie crust that blends so well with the pumpkin flavors in the cheesecake. For the filling we warmed pumpkin purée, brown sugar and pumpkin pie spice on the stove to melt the brown sugar and really get the sugar and spices blended wonderfully with that pumpkin. And then that is blended with cashews, coconut milk, coconut oil, maple syrup and a little lemon juice and vanilla extract. Simply divine! And then for the topping…..a fabulous caramel sauce made with vegan butter, brown sugar, coconut milk, vanilla and sea salt. This sauce is heated on the stove to a simmer and then simmered for a few minutes (stirring constantly) until thickened. 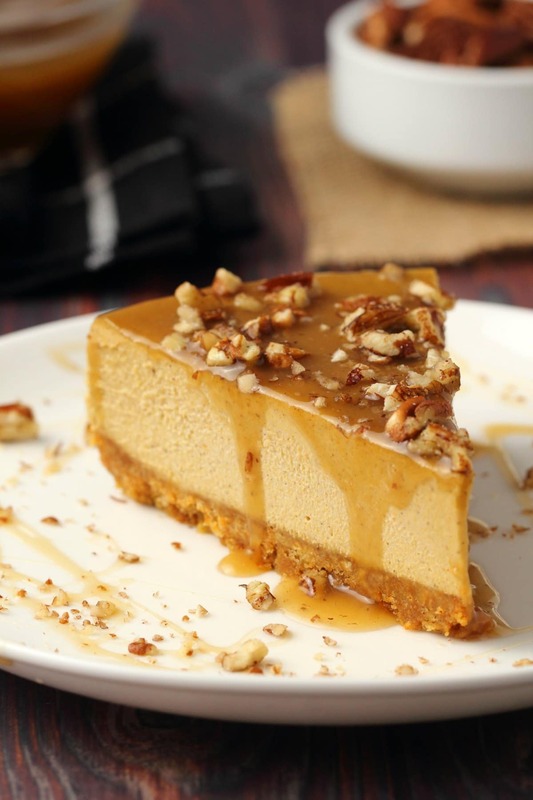 Pour the caramel sauce over this pumpkin cheesecake and then top it with some crushed pecans and you have a dessert that will wow anybody! If you have a struggle getting vegan gingersnap cookies, you could make some yourself, or you could use a different vegan cookie. Golden oreos would also work great for this though you would miss that ginger flavor. Use a gluten-free cookie if you want to make this cheesecake gluten-free. 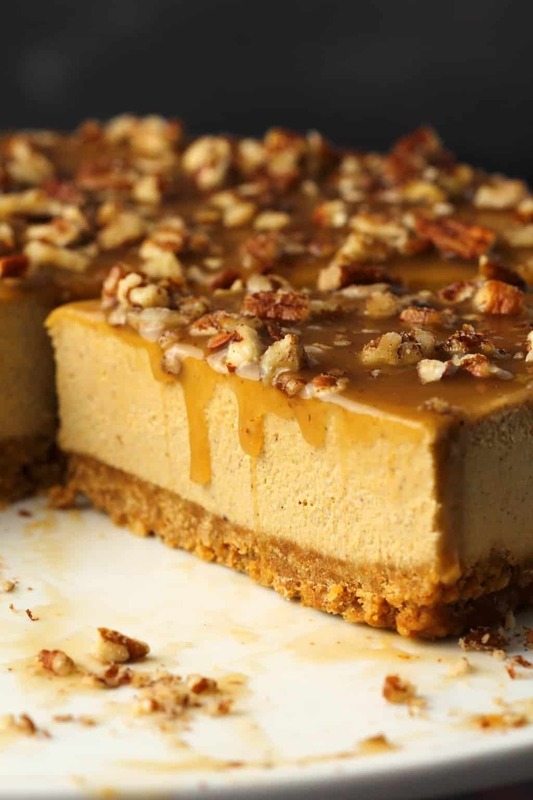 The caramel sauce is optional, if you wanted to you could serve this with some vegan whipped cream instead of making the caramel topping, but the caramel sauce is really so good I definitely recommend you give it a go. 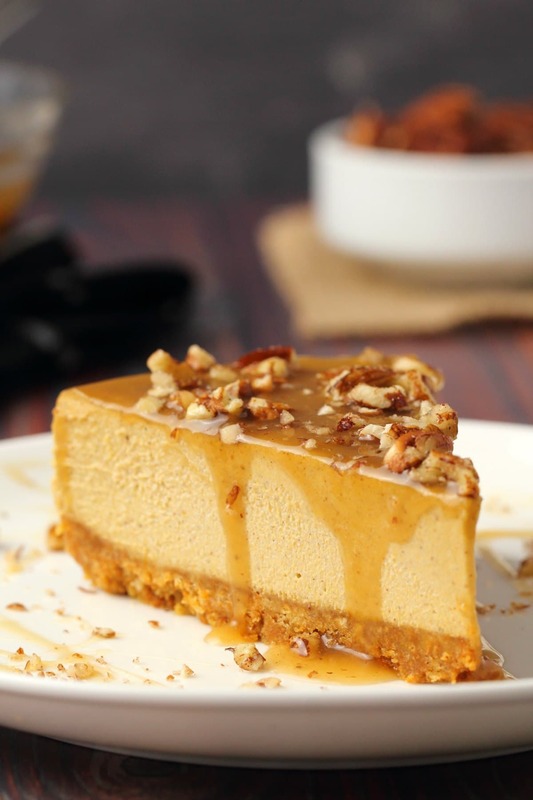 You might well have some caramel sauce left over, even after adding more to every slice of cheesecake you serve. So use any leftovers as a topping for ice cream, on pancakes, or just eat it with a spoon! Keep leftovers in the freezer and let thaw for 30 minutes to an hour before enjoying. 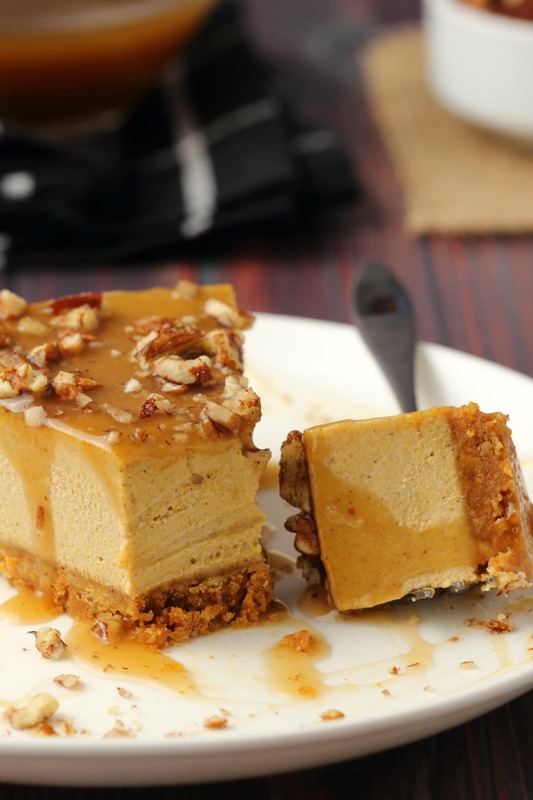 So let us know what you think of this vegan pumpkin cheesecake! And please rate the recipe too! Thanks. Sign up to our email list to stay updated with all our latest recipes posted to the blog. 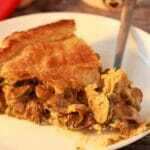 We’ll send you a fabulous 10-recipe ebook containing delicious dinner recipes as a thank you for signing up. 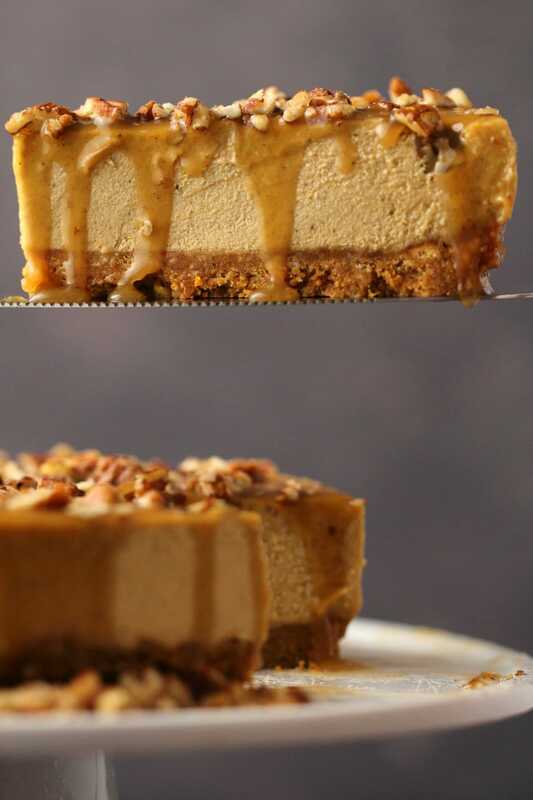 Deliciously rich and decadent vegan pumpkin cheesecake packed with flavor and topped with a caramel sauce and crushed pecans! 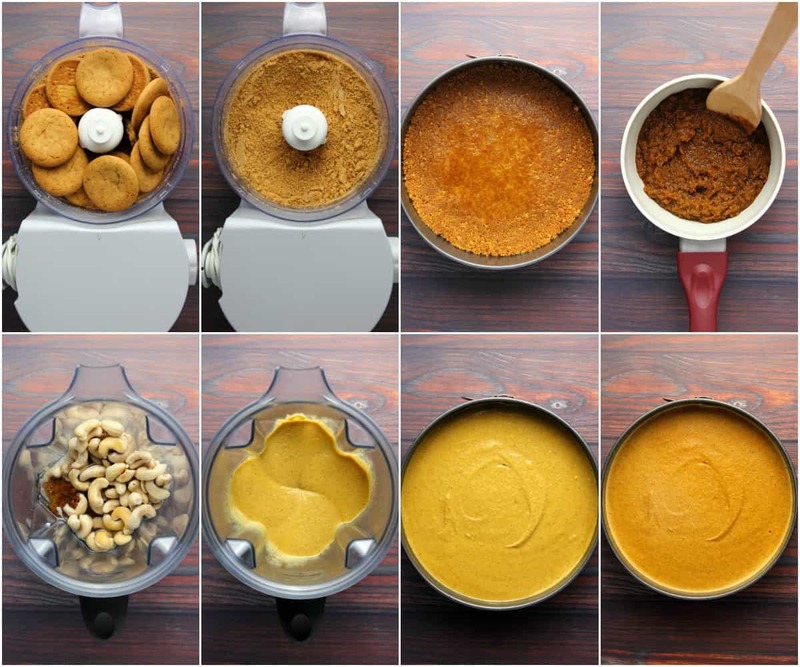 Add the gingersnap cookies to a food processor and process until only crumbs remain. Transfer to a mixing bowl and add in the melted butter and mix in with a spoon. Prepare an 8 inch springform pan by spraying it with non-stick spray and lining the bottom with a circle of parchment paper. Transfer the ginger cookie crumbs and vegan butter mix to the springform pan and pat down firmly with the back of a spoon. Place into the freezer to set while you prepare the filling. Pour boiling water over the cashews and let them soak for 15 minutes. Add the pumpkin purée, brown sugar and pumpkin pie spice to a saucepan and heat, stirring constantly until hot. This allows the brown sugar to melt and the flavors to blend with the pumpkin purée perfectly. Remove from the heat when hot and add to a blender jug along with the coconut milk, maple syrup, melted coconut oil, lemon juice and vanilla extract. When the cashews have finished soaking, drain them properly and then add them to the blender jug. Blend very well until completely smooth. Pour the filling on top of the ginger cookie crust and return to the freezer to set completely. This will take several hours, at least 4-6 hours or you can just leave it overnight. When the cheesecake has set, remove it from the springform pan and let it sit at room temperature for about 30 minutes to thaw before serving. Prepare the caramel sauce by adding brown sugar, vegan butter, coconut milk, vanilla and salt to a saucepan and bringing to a simmer, stirring constantly. Continue to simmer at low heat for a few minutes (stirring constantly) until the sauce has thickened slightly. The sauce will thicken more as it cools. Remove from the heat and let it cool. You can speed up the cooling process by placing the pot into the freezer. 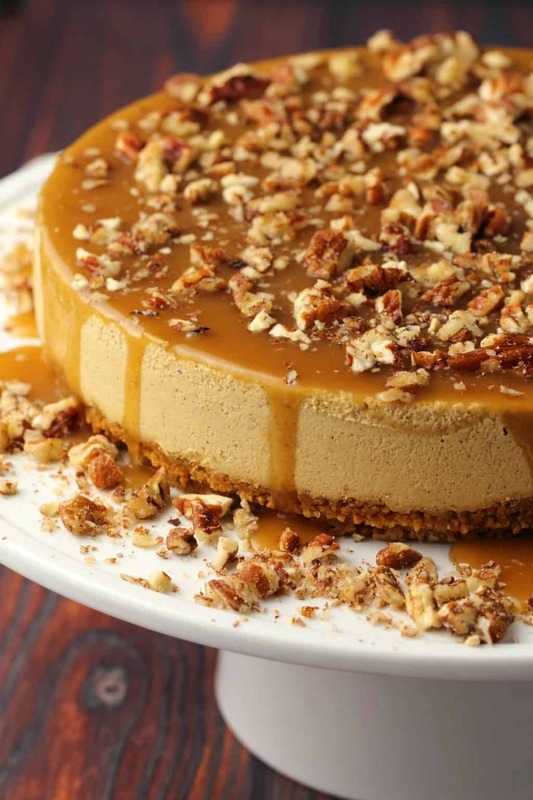 Once the caramel sauce has cooled, spoon it out over the top of the cheesecake and decorate with crushed pecans. *If you can’t get store-bought ginger cookies, you can make your own (if you make your own then measure them by weight, not number of cookies) or you can switch for a different cookie such as golden oreos. If you want this cheesecake to be gluten-free then use a gluten-free cookie. If you use a different cookie (store-bought gingersnaps are quite dry), you might be able to use less vegan butter. *Usually I would have soaked my cashews overnight for a cheesecake but I kept forgetting to do it. So instead I found 15 minutes in boiling water to be enough to make them perfectly soft and not put too much strain on the blender. If you prefer though you can soak them overnight in cold water. 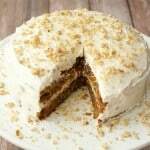 *Nutritional information includes the full batch of caramel sauce and crushed pecans for the topping. 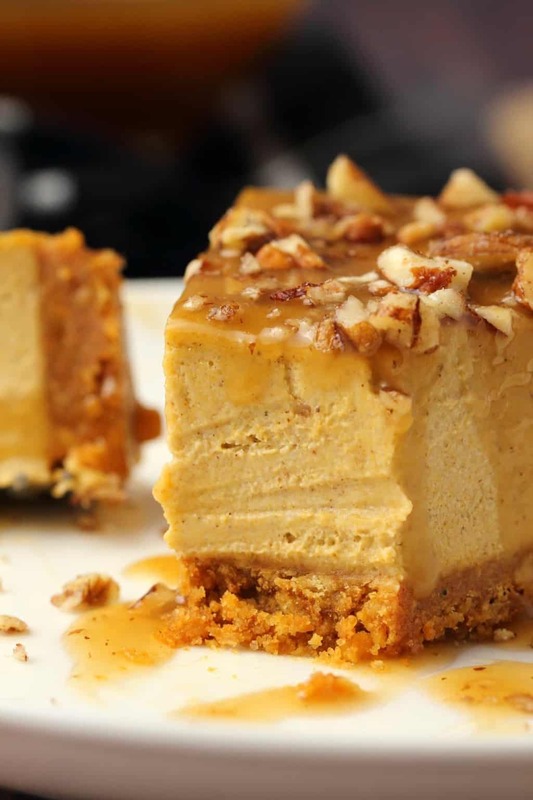 *Recipe adapted from our Vegan Cheesecake with Salted Caramel Fudge Sauce. 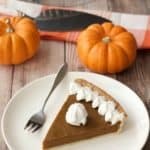 Vegan Pumpkin Pie – Super Easy! Previous Post: « Vegan Gravy, Rich and Flavorful! Totally decadent with delicious pumpkin flavour! We use your recipes as often as they come our way . Wowza!!!! I licked the spoon and I can’t wait until I can eat it with the topping! 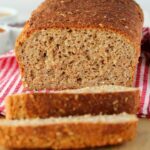 I wanted to make something different for our family dinner and I think even my dairy-eating family members will love this! Will this be okay left in the fridge after it sets or does it need to be frozen until ready to serve? Made this yesterday for Thanksgiving and didn’t tell anyone that it was vegan. Everyone LOVED it! I’m a vegan with a terrible sweet tooth. I have always loved pumpkin but I’ve only been vegan for a few years. 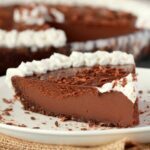 I’m always trying to find sweets to make that are truly delicious that anyone would love. This is definitely the best pumpkin pie or cheesecake I’ve ever had. I wanted to post the picture I took so bad because I’m so proud of this beautiful pie. I will be making it again and some if the others. I don’t often write comments after making a recipe, but I felt compelled to do so with this recipe. I made it exactly as it is written, for Thanksgiving, and it turned out perfectly. 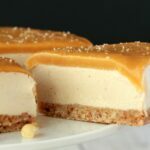 But, I loved the look of the caramel topping on the “regular” cheesecake; and I had to make a cheesecake that was gluten/grain free, for a gluten intolerant friend. So, I made a macadamia nut/date crust; I followed exactly the pumpkin filling part of the cake; then, I made the thick caramel from the regular cheesecake, for the top. The cheesecake turned out even better the second time I made it, making the adjustment noted above. Your recipes are flavorful, easy to execute, and, above all, cruelty free. 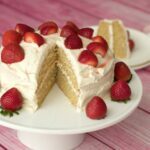 Thank you for sharing your beautiful recipes! 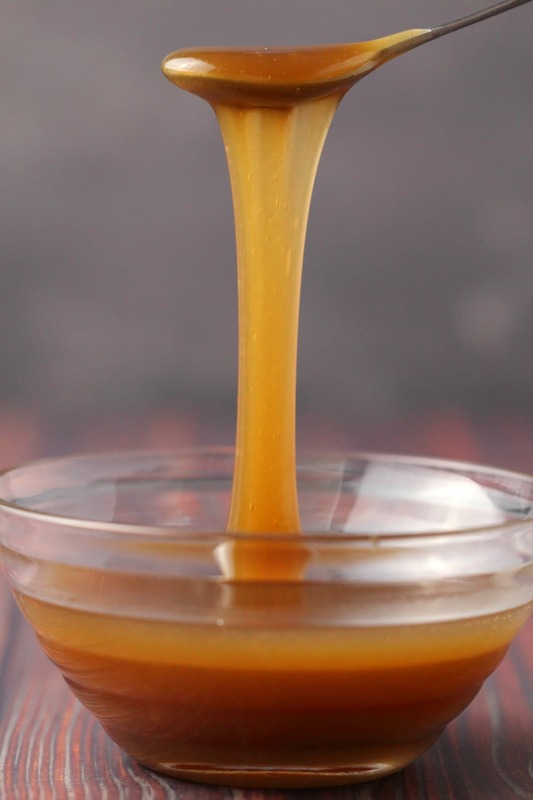 2) For the caramel sauce add a splash of REAL maple syrup (at least 1 tablespoon, but I added a probably three) and it will add an amazing maple flavour to it. 3) Also you have to boil the sauce a while longer. Closer to 30 minutes. Probably want it to be reduced to a third of the original volume. Hi! Dear Alison, please tell me what substitute I can use for the vegan butter? 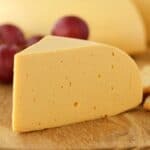 Does margarine works? Or maybe anything else? I live in Romania and here we don’t find vrgan butter. Thanks! Margarine is totally fine! Just look for a dairy-free one. Or you can make your own homemade vegan butter.